*Early bird special: Use Promo Code: SAVE15 to get 15% off your tickets!! *Offer is only good until May 13th, 2018 at 11:59PM! Don't wait, buy now and save! Ticket insurance available! No other discounts will be offered for this event! 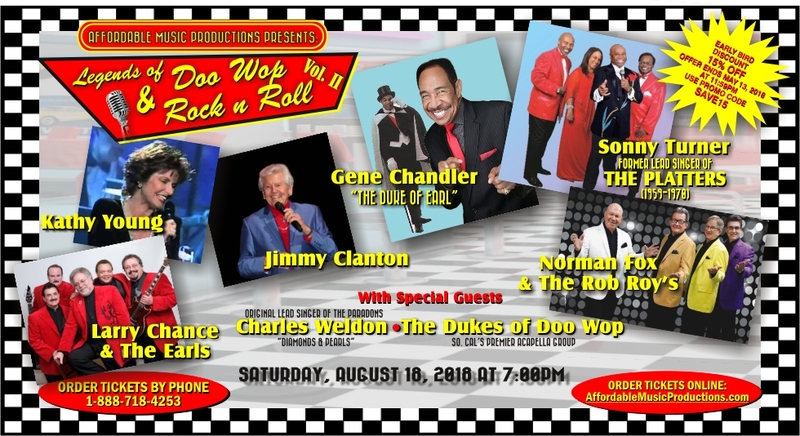 For one night only, Saturday August 18th, 2018 @7pm at the California Theater in San Bernardino CA., these legendary artists of the 1950's and 1960s, will perform all their most famous Doo Wop & Rock N Roll hits that topped the Billboard charts and sold millions of records worldwide. Don't miss this rare opportunity to see these legends perform all under the same roof in 1 show! Gene Chandler- "The Duke of Earl"
Sonny Turner (former lead singer of The Platters 1959-1970)- "Great Pretender" "Only You"
Jimmy Clanton- "Just A Dream" "Venus In Blue Jeans"
Larry Chance & The Earls- "Remember When" "I Believe"
Norman Fox & The Rob Roys-"Tell Me Why" "Dance Girl Dance"
Kathy Young- "A Thousand Stars"
Charles Weldon (original lead singer of The Paradons)- "Diamonds & Pearls"
Have your chance to MEET AND GREET these legends after the show. Share your memories with them, get their autograph, take a picture, maybe even get a kiss on the cheek or a warm hand shake! These Artists plan to make this a special evening for you all! Enjoy a PRE SHOW MEET N GREET VIP UPGRADE that is available by selecting this upgrade at checkout online or by requesting it during a phone order. You will receive a ticket for access to a 1 hour private meet and greet session with the artists. Limited to the first 100 guests to purchase the upgrade! Order tickets right here!! Right now!! You can Select Seats, or chose Best Available. Click here, or call in your order to our Box Office at 1-888-718-4253. Group Sales (10 or more) call Don at 951-317-2155. *Acts are subject to change without notice. All sales are final. No refunds. No exceptions. All associated processing fees and taxes are included in the ticket price offered. Also included is Parking, a color show program, and a meet n greet with artists after the show. This venue offers Beer, Liquor, and Wine at its own discretion. There are no refunds, no exceptions. All acts are subject to change without notice. California Theater 562 W. 4th St.